Silk was first produced in China about 3000 years ago – they called it ‘Woven Wind’. Over time silk became one of the most valued commodities and the great silk routes were established. It was especially coveted by the Romans who were prepared to pay its weight in gold. Great skill is needed to unwind the silk threads from the cocoon of the silk worm – often made with a single thread up to a mile long. Silk threads can be woven in many different ways to give sheer, smooth or textured fabrics. The silk I use for my wall panels is Habotai 8, a smooth, even-weave silk that is robust enough to frame, yet can still take up the dyes evenly. The dyes are manufactured by Henri Dupont of Paris. The silk is pinned out evenly on a frame. 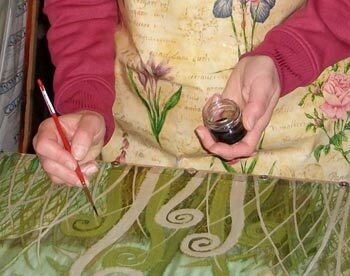 The colours are diluted to give the desired shade and painted onto the silk with a brush. The dyes soak into and spread throughout the fabric so as to produce a design. To achieve a particular design eg. a leaf, the shape must be outlined with a clear, viscous substance called gutta. This is contained in a small bottle and applied through a fine nozzle. Once dry, the dye can then be painted within or around the shape. Hot wax, applied with a brush, can also be used as a resist. Successive layers of wax and dye can be built up to give depth and contrast. To fix the dyes the silk is rolled in newspaper and steamed for approximately 2 hours. After washing and ironing to remove resist and surplus dye the silk is stretched over a wooden frame and backed with cotton, giving a lightweight wall panel ready for hanging.